• Polished stainless steel case. • Galvanized, white silver plated dial. • Black printed hour markers in a mix of Arabic Numerals & indexes. • Fine printed minute track with Arabic Numeral incremental markings. • Blue steel hour & minute hands. • Small seconds sub-dial with blue hand. • Measures at only 3.2mm thick. Despite its slim profile the movement is extremely precise. • Approximate power reserve of 42 hours. 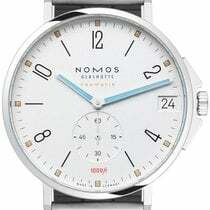 • Equipped with the NOMOS swing system. • Tempered blue balance spring. • Bi-directional winding rotor, that stops turning when the mainspring is fully wound. • Tempered blued steel screws. • Rhodium plated surfaces with Glashütte ribbing and NOMOS perlage decoration. Over the years we have earned recognition as an honest and dependable watch dealer. We encourage you to independently research our company and we look forward welcoming you to the Prestige Time family of customers. Product Availability: We do our best to accurately offer a delivery time frame on our ads. If the item is currently in stock, we will ship within 1 to 2 business days. If an item needs to be ordered in, we will notify you in a timely fashion with an estimated shipping time frame. Guarantee: Prestige Time LLC guarantees this watch to be 100% genuine, brand new & unworn. The watch will have its original manufacturer’s serial number intact and unaltered. The watch will be delivered in the original box and will include all papers including the warranty card/book. Prestige Time LLC Limited Warranty: Our warranty on this watch is for a period of 2 Year Warranty from the date of purchase. USA Orders: Shipping within the USA: We ship FREE via FedEx Express Saver 3-4 business days delivery. Expedited FedEx delivery options are available at an additional cost: 2nd Business Day Air $25, Next Business Day Air $40, FedEx Priority Overnight Air (delivery before 10:30 AM the next business day) $65. Our preferred method of shipping is via FedEx, alternate shipping options and methods are available upon request. All packages shipped are fully insured against loss, theft and damage during transit. Please note: due to the nature and value of the products we sell ALL packages will require a signature at the time of delivery, no exceptions. Shipments to Alaska, PR and Hawaii: Orders shipped to Alaska, Puerto Rico and Hawaii will be charged a flat fee of $60. Sales Tax: Prestige Time is located in NY State, we are required by law to collect sales tax on all deliveries within the state of New York. The sales tax rate will be calculated by the delivery address sales tax jurisdiction, typically ranges between 7.50% - 8.875%. Shipments of large or heavy packages: On some items which are extraordinarily large or heavy, we may need to adjust the pricing for shipping. If such is the case on an order you placed we will notify you with a custom quote before we process the order. International Orders: Importing Taxes & Duties: Our sale price is before importing taxes & duties such as VAT, GST, PST. Taxes & duties will be assessed and charged separately when the watch clears customs in the delivery country. Taxes & duties are the recipients responsibility to pay. Taxes & duties are generally billed to the recipient by the courier with payment due prior to delivery. International Shipping: Our preferable method of shipping is via DHL or FedEx Priority International. We are also able to ship via Express Mail Air Post. All packages are shipped in a well-secured box. All watches shipped are insured for the full value which covers against loss, theft or damage in transit.